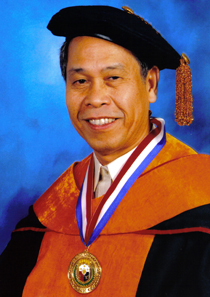 Dr. Libertado C. Cruz has been recognized for his outstanding contributions in the field of animal science, particularly in reproductive biotechnology. His research findings formed the bases for developing wide-scale Artificial Insemination (AI) procedure in water buffaloes which has become standard procedure for the National Carabao Development Program. Further, his studies with students and co-workers elucidated the physiological basis and appropriate protocol for the synchronization of estrus on large animals, followed by studies on understanding follicular dynamics in water buffaloes and development of protocol to induce superovulation and embryo transfer, in vitro fertilization and cryopreservation of water buffalo embryos. These technologies are now part of the national program and have contributed to genetic enhancement of water buffaloes and small ruminants, hastening the Livestock Genetic Improvement Program and Development, and benefitting smallholder families in the country. Dr. Cruz has also mentored junior scientists to motivate and expand their technical competencies for R & D.